Every company thinks “I’ll develop an app, it’ll be easy, cheap and quick. Everyone will download it and they’ll all love it! It’ll be the best app in the world!” but I hate to tell you, that’s just not true. You are not developing and maintaining a single app. As different brands have different software – iOS, Android, Windows, Blackberry, etc. – you need to develop and maintain a minimum of 5 different apps, with at least 2 new systems released every year! 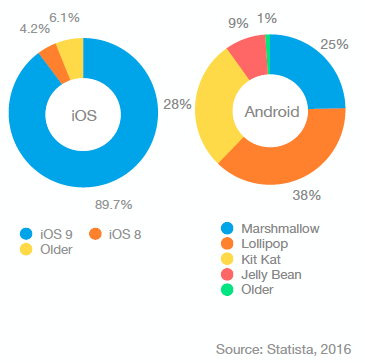 This graph shows the adoption of the latest iOS and Android operating systems in June 2016. Developing an app is not cheap. The average cost to initially develop an app is $270,000*, but this figure does not include manager time cost, integration costs, infrastructure costs and maintenance costs. In fact, brick and mortar companies should budget for a minimum of $2.5m to develop and maintain an app with basic functionality over the course of 3 years. Everyone aims to mimic Starbucks incredible app, however what they don’t realise is that their most recent app investment was $80m! Your customer won’t use your app for at least 7 months from the beginning of development. 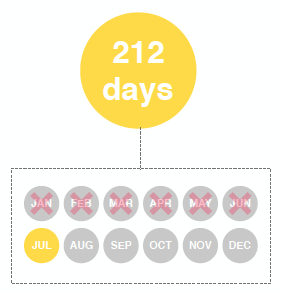 The average time to develop and launch an app in the app stores is 7 – 12 months*. In such a fast-moving environment where you have to keep up with the likes of Starbucks and Pokemon Go, 7 months is not time you can afford to be wasting. Only a minority will install and use your app. 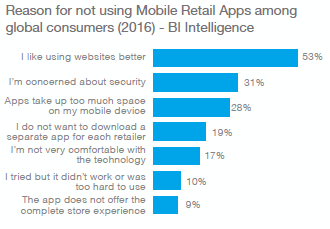 On average, only 2 out of 100 shoppers will download and actively use your app! So why not consider a quicker, more efficient way? If you would like more information on how you can utilise mobile wallet, contact us here and don’t be afraid to connect with us on social media or leave your comments below.